Flush with cash and looking for a toehold in the United States, Canadian marijuana companies are making big investments in hemp. Canopy Growth (NYSE: CGC), an Ontario marijuana producer that snagged an investment for 5 billion Canadian dollars ($3.8 billion) from a New York alcohol company, recently announced it is entering the U.S. hemp market. Canopy said it has a license to grow hemp in New York and will spend up to CA$200 million to build a hemp-processing facility near Binghamton. Canopy also loaned CA$9 million to Greenhouse Juice Co. of Toronto to develop a line of CBD beverages to sell in both Canada and the U.S. Village Farms International (TSX: VFF), a British Columbia company that produces greenhouse-grown tomaoes, bell peppers and cucumbers, announced plans to enter the U.S. hemp-derived CBD market and list on the Nasdaq stock exchange. Another British Columbia company, True Leaf Pet, which makes hemp-derived animal treats both with and without CBD, hired a former Petco retail chain executive and joined a U.S. hemp industry coalition to petition for hemp to be a legal ingredient in U.S. animal feed. Both moves position it for greater market share in the U.S.
It’s a no-brainer for Canadian companies to ratchet up involvement in the U.S. hemp because of the 2018 Farm Bill, said Russ Crawford, president of the Canadian Hemp Trade Alliance. That’s because hemp’s new legal status makes it an obvious route to finding U.S. consumers. The Farm Bill is going to push the market for hemp-derived CBD in the U.S. to at least $6.1 billion by 2023, according to Hemp Industry Daily’s Special Report, 2018 Farm Bill: What’s Next For Hemp? Canadian marijuana companies no longer endanger their positions on U.S. trading exchanges as long as they enter the country through hemp products. “It’s logical these processors would be interested in the hemp industry,” Crawford told Hemp Industry Daily. Hemp entrepreneurs in the U.S. don’t yet have the same access to capital as their northern neighbor but they’re watching the Canadian moves closely. 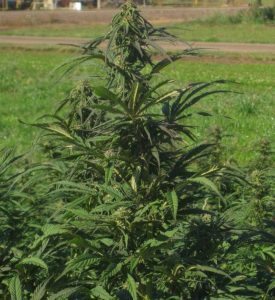 “The big money coming in validates the industry,” said Rick Weissman, president of High Falls Extracts and High Falls Agriculture, companies that grow and process hemp in High Falls, New York. Weissman grew just 4 acres of hemp last year near where Canopy is planning its multimillion-dollar hemp spread. So is he worried about survival after his multimillion-dollar neighbor opens? Hardly. “We could say, ‘Oh, the big guy is going to step on us,'” Weissman said. The larger players will drive down CBD prices, he added. But they’ll also bring more processing infrastructure which could curb prices for extraction and other toll processing. And CBD’s popularity is growing so sharply that even an influx of Canadian hemp might not depress prices much, he said. Some U.S. hemp manufacturers said the Canadian influx isn’t any more significant than many other Farm Bill changes shaking up the hemp sector, from nationwide commerce to better access to banking services. “It’s a completely new time for the hemp industry,” said Gregory Drakhler, chief product developer for Farmacy Bliss, a CBD manufacturer in Walnut Creek, California. He said hemp is “coming slowly but surely to a nationwide, regulated market, and when you do that, you play with the big money. Others say they expect Canadian firms to bring dramatic changes to the hemp industry. “They have a head start, considering that they have capital and are traded on the biggest exchanges,” said Chase Terwilliger, CEO of CBDistillery, a Denver-based CBD manufacturer. Where is the future if CBD? It’s Clean Organic Solvent-Free CBD!! This is the major Canadian advantage – a highly efficient regulated industry that eliminates toxic, ‘fake’ products and growers. Not sure USA/CHINA or others will rise to the challenge without cheating. I have worked with Canadian cultivators and extractors in their U.S. and Canadian facilities. Their products are no safer for human consumption than anyone else’s. Our team of Ph.D.s has all the best testing and analysis equipment and we have eyes to see diseases and insects. I’ve been there and was hired to help with this problem and met resistance at the same points I met in other countries… MONEY! My area of interest is in CBDA; the more biologically active forms. Monika, I agree with what you say. I would like to point out that the best government money can buy is back on the job, finally. It seems to me Hemp farming for CBD will likely be very limited this year. Congress should have passed the farm bill in April not December. Even in September with the old bill expiring they found other things to do. First it was Kavanaugh. Then it was the it was the mid terms. Then it got passed and signed and the government turned it over to the FDA and then got shut down for 35 days. They are supposed to settle their differences with in 3 weeks. then when they can’t they will be shut down again for the next who knows how long. The division in our government has paralyzed the regulatory agencies. On the positive side of all this consternation is the fact that the hemp industry and CBD industry can write it own regulations to live by. We need certified seed, a verifiable quality standards. Federal certification is still a ways off. In the meantime, we have 99.9% feminized, high CBD, and THC compliant strains currently available. Contact [email protected] if you are interested in high-quality seeds. Grown with pride in the USA so no issues crossing state lines. The last thing we need is certified seed. This market finally gives farmers the chance to break away from the conglomerates like Monsanto. Farmers need to develop their own seeds that work best in their environments. Having your own seed in bins for spring planting is crucial for success. Buying seeds makes only the seed retailers rich, not the family farmers. Certification always has been and always will be a scam. To what end? Take more of your hard earned money for a piece of paper and a stamp on a bag. No thanks! Estaba buscando esa informacion hace edad, te lo agradezco, estoy de resolución con tu punto de vista y heno igual. I’m happy to hear that they are investing in small companies and helping them develop.